Here is the preliminary video test that I am turning in today. Geometry Placement – Mirror and floor reflections need to line up more with tracked footage. Shadow pass in process of being re-rendered so that mirror geo doesn’t cast shadows. 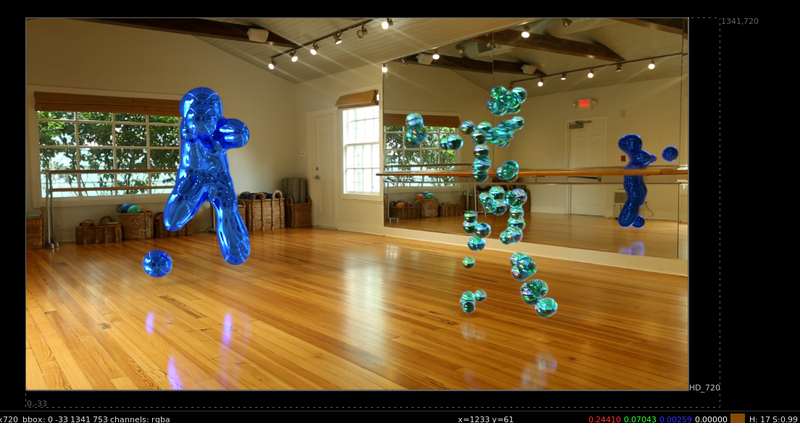 Need to run separate color correction for bubbles vs. Koons blue figure. A quick render of the fill layer with two different dancers: A blue chrome dancer inspired by the work of Jeff Koons, and a rainbow bubble dancer inspired by the work of glass artist, Chihuly, and the iridescence of bubbles. While working on the shading for my dancers in Maya, I noticed that I was unable to add textures, as my alembic files had no UVs when they were imported into Maya. After a little bit of research, I decided to do some tests to see if I could troubleshoot the problem and come up with a work around. 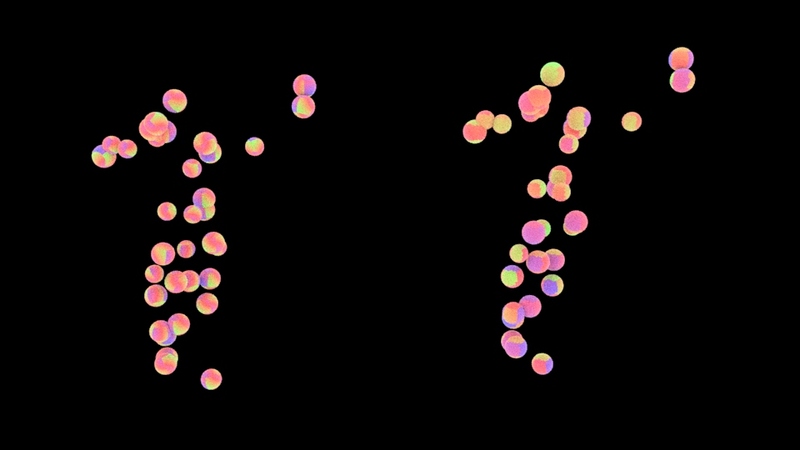 Spheres were copied onto the points of a particle system attached to the motion capture character rig. I knew that the geometry and animation worked when brought into Maya, but that the UVs were missing. I first added some Houdini UV nodes to the node tree, and opened up the UV Layout option into Houdini to study the results. It was evident that the spheres were unwrapping in an unnatural way. I brought a test alembic of the dancer into Maya and put an aiStandard shader with a ramp in the diffuse color channel to study the results. 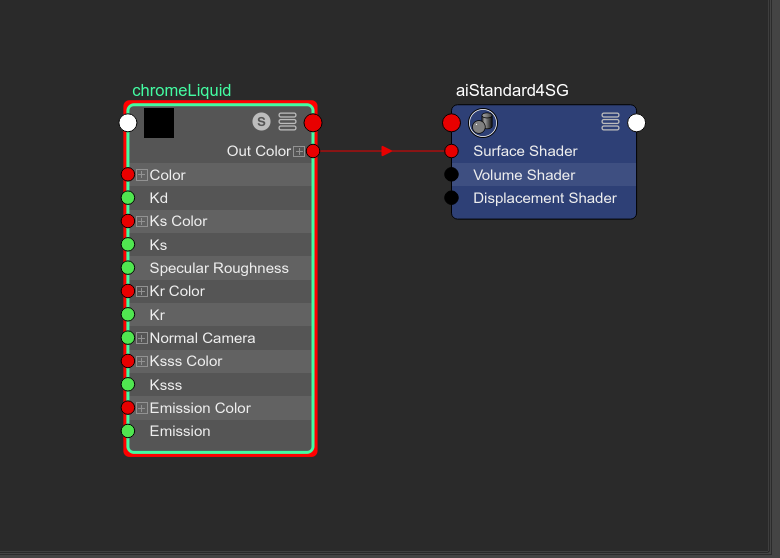 In the image below, you can see how the colors in the ramp shader were read in pieces rather than in a smooth ramp. The tweaking of values (left figure) resulted in a slight improvement, but it still wasn’t as smooth or responsive to the ramp as I liked. I revisited the Houdini file and adjusted the UV process. I moved the UV nodes higher up in the node hierarchy so that the UVs were established on the base sphere before it was copied to multiple points. With a bit of trial and error, I realized I did not need the UVunwrap node for this process, so I flagged it yellow to “bypass” it. Now all of the copied spheres should have the same polar UVs. I tested this in Maya with same ramp shader, using side by side comparisons to study exactly what changed. The figure on the far right is the dancer with polar UV coordinates for each sphere. The linear ramp was noticeably smoother in this iteration. 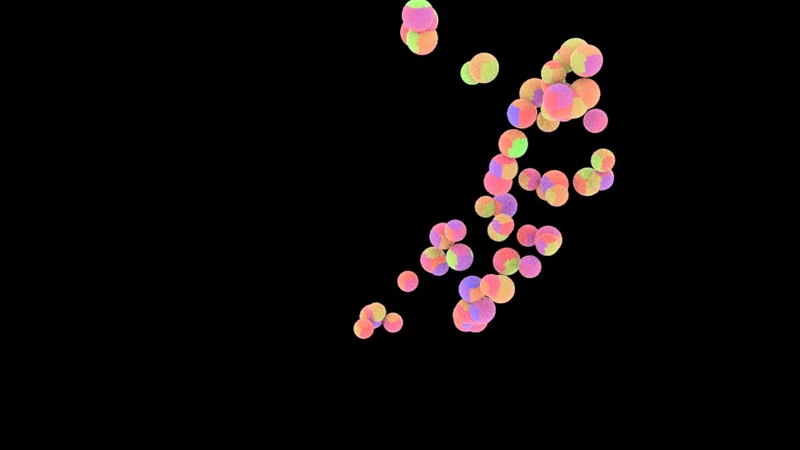 I also added noise to study how the UVs broke up the noise across the surface of the spheres. After running these tests, I used the polar UV method and re-imported the alembic into my dance studio scene. Reflections work in chrome spheres but not in a plane that is made to be reflective. I tried different materials on the plane, adjusted specularity and refraction, and tried to rotate the position of the aiSkyDome, but I am still not sure why this is happening. The dancer motion capture data starts on frame 425 and I’m not sure how to adjust this so that it starts on frame 1 instead. 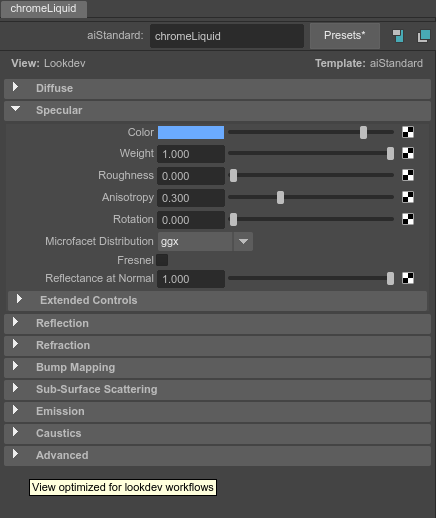 Professor Gaynor showed me how to offset the animation of an alembic file. 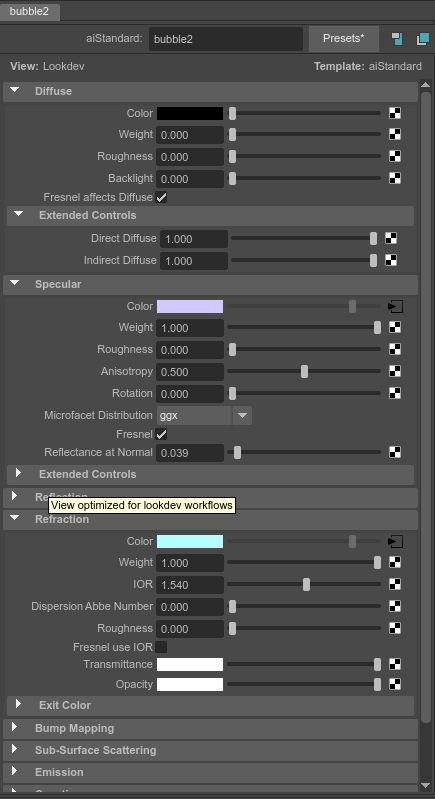 The following controls were located in a tab on the attribute editor. By making the frame offset – 425, I was able to start the animation much closer to frame 1. I did some quick shader and effects tests today in class. I brought my original chrome sphere dancer back into Houdini to try to adjust the shape and form. Then, I brought in the new dancing figures as an alembic file to test in Arnold for Maya. Due to illness, I was unable to make a lot of progress on Project #3. I began camera tracking, started the gray ball match, and started to set up render layers in Maya. 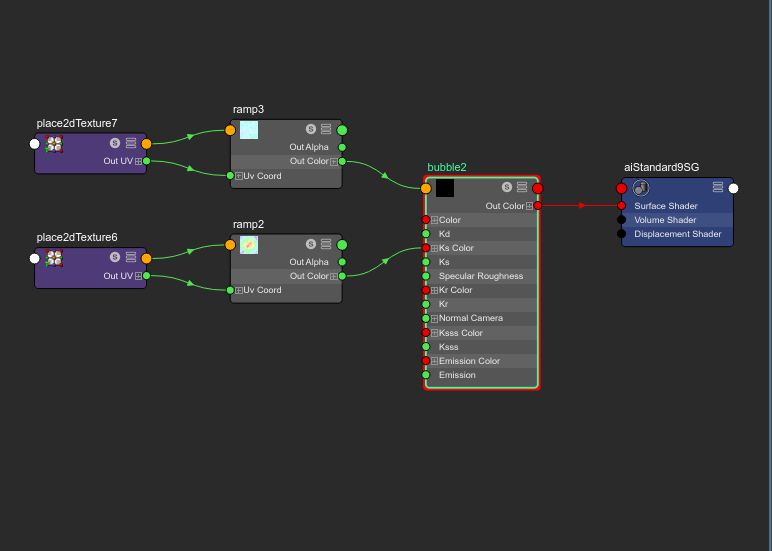 I was able to export an .fbx file from Nuke with the camera and point cloud and bring it into Maya as a test. I plan to continue to refine the camera track, continue to work on the gray ball match with the still frame, and further develop the shaders. I plan to further develop and integrate two motion capture effects this quarter. 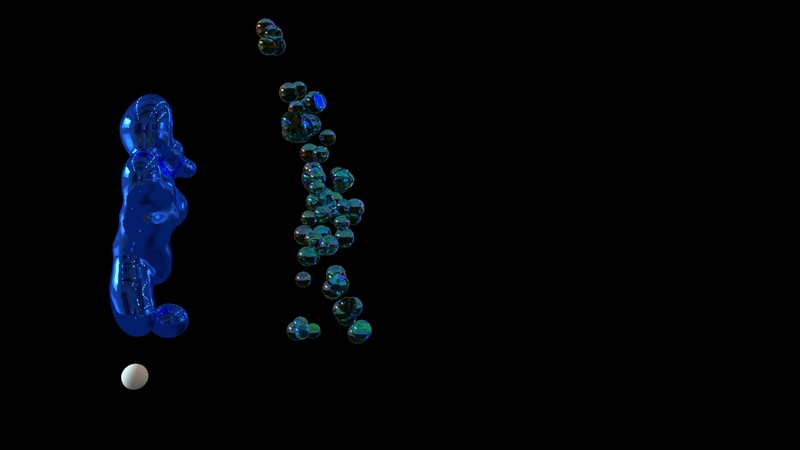 The first I want to develop further is a motion capture asset with chrome spheres — I plan to adjust the shaders on the spheres. The other effect is a fish-scale pattern that I was able to get working in Houdini but not in Maya last quarter. I’d like to get this effect functioning in Maya so I can further develop the shader and overall look. I plan to try out refractive materials on the motion capture geometry.